Steps to building a quality pool. After our award-winning pool designer has completed the design of the pool, we move to the construction phase. Our goal is to make this a pleasant and fun experience for the new pool owner. Once your pool design is complete; we are ready to start the process of building your outdoor dream. • Engineering is requested for the construction project. • Once the permit is issued; our construction team schedules a pre-site meeting with you to review your construction project. After the pool has been laid out, excavation begins and steel reinforcement is put in place. The rough plumbing is installed before a final structure inspection is done. The concrete crew pneumatically "shoots" the concrete with state of the art equipment designed to improve the structural integrity of the pool shell. With the concrete shell in place, the deck area is graded and compacted to reduce concrete cracking, and the remainder of the plumbing is installed. The plumbing is pressure tested to ensure there are no leaks. The deck crew forms the deck area, pours the concrete and then applies saw cuts to the deck within 24 hours to reduce cracking. If the pool owner has chosen the option of upgrading to coping, it is installed before the concrete deck is poured. Tile is then installed around the perimeter of the pool at the 6" waterline row. If acrylic decking is chosen, texture is added to the concrete before the color coat is applied. If pavers are being used instead of the flocrete decking, they are laid by the paver crew. The equipment is now installed. This includes the filter and pump as well as any optional features chosen by the pool owner. The caged area is measured and the aluminum cage is installed on the decking. Upon completion of the pool finish, a child barrier fence or alarm system is installed. After the screen cage is complete, the pool shell is cleaned and prepared for the application of the pool finish. Immediately after the pool finish is applied, the pool will be filled with water to cure the pool finish. Our trained staff then begins to brush the pool and apply the chemical treatment. It takes a minimum of 28 days to balance the chemicals and prepare the pool for use. The yard is cleaned and graded and readied for landscaping. With the final pool deck coating applied and the chemical treatment completed, the pool is ready to be used and enjoyed for many years to come. 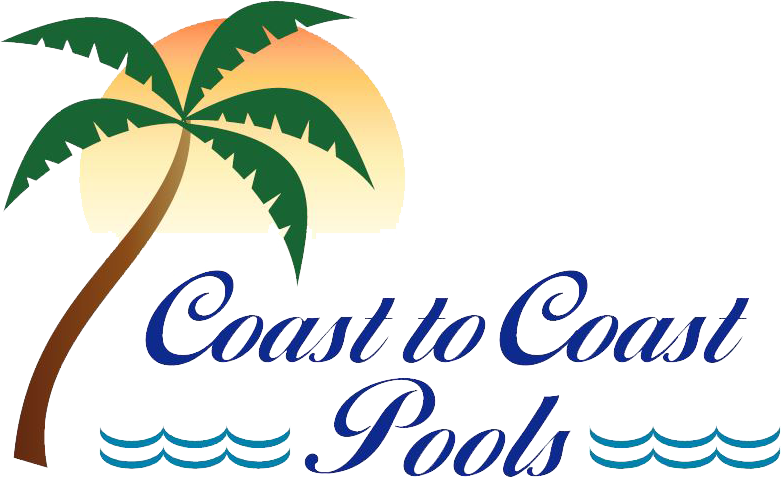 To provide customers with the information needed to maintain their new pool, we offer our Coast to Coast Pool School. We will schedule a time for one of our pool pros to instruct the pool owner on the proper operation and maintenance of their new pool. This will ensure many years of trouble-free enjoyment and relaxation for the new pool owner.